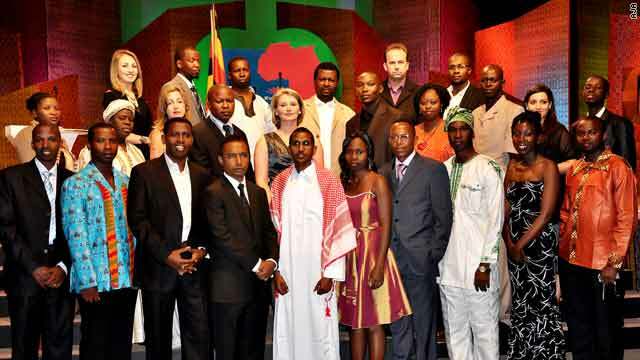 The finalists at the 2010 African Journalist Awards in Kampala, Uganda. Rogers: "People can now see what's really going on. The truth has been outed." CNN International's longest-running feature programme, "Inside Africa" will report on the Awards on Saturday June 5 at 1600 BST. 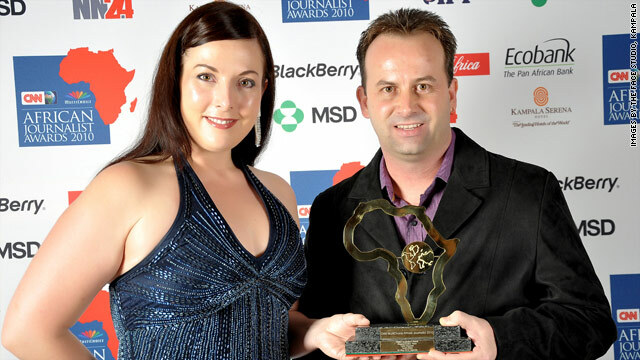 (CNN) -- Sam Rogers, from South Africa, has been awarded the top prize at this year's CNN MultiChoice African Journalist 2010 Awards Ceremony. Sam Rogers, Executive Producer of Factuals -- Crime and Investigation Unit, e.tv, won for her story "Curse of the Nobody People," which was chosen from among 2074 entries from 40 nations across the African continent. "Curse of the Nobody People" focuses on the discrimination and sometimes shocking fate of albinos in Tanzania. Sam Rogers was one of 27 finalists at the Awards ceremony on Saturday evening and was a winner in the category "Television Features Award." The Awards, which rotate location each year in tribute to their pan-African credentials, were held at an Awards Ceremony and Gala Evening in Kampala, Uganda this evening, Saturday May 29, 2010. His Excellency, the President of the Republic of Uganda, General Yoweri Kaguta Museveni; Collins Khumalo, President, MultiChoice Africa and Parisa Khosravi, Senior Vice President of international newsgathering for CNN Worldwide presented Sam Rogers with the Award. Sam Rogers said: "I'm astounded, very honored and so glad the story has a platform. People can now see what's really going on. The truth has been outed." Chair of the judging panel, journalist and media consultant Joel Kibazo said: "The journalist told the story with care and sensitivity. She did deep research covering all the angles including the victims, traditional doctors and even the police and the local media. The victims were given a voice and also overcame risks in telling the story. It is a complete piece of work". Parisa Khosravi, Senior Vice President of International Newsgathering for CNN Worldwide, said: "Each year, the men and women who enter these awards prove that they have the determination, professionalism and courage to showcase Africa's stories to the world. In doing so, they highlight the depth and strength of journalism across the continent." "Each year, the men and women who enter these awards prove that they have the determination, professionalism and courage to showcase Africa's stories to the world. Collins Khumalo, President MultiChoice Africa, said: "We are very proud to once again partner with CNN International to recognize and encourage excellence in journalism in Africa. "The CNN MultiChoice African Journalist of the Year Awards have become one of the continent's biggest and most coveted journalism awards and celebrate the hard work, talent, sacrifice and the dedication that the best among our journalists commit to their work. The awards have grown significantly over the years and we have witnessed previous winners become internationally recognized for their talent and hard work -- watching their rise to fame as respected reporters on Africa has made our investment in these awards truly rewarding. It is a great honor to be in Kampala hosting these awards for the very first time." Nico Meyer, Chief Executive Officer, MultiChoice South Africa, said: "As all eyes turn to South Africa this month, it is imperative that journalists are encouraged and supported to tell the African story with passion and excellence. These awards help us to recognize those great stories. This is without a doubt, Africa's year and we look forward to celebrating more great examples of passion and integrity in journalism next year." The CNN MultiChoice competition is now in its 15th year. Prestigious sponsors include: Coca-Cola Africa; Ecobank, IPP Media, Tanzania; Kampala Serena Hotel; Merck Sharp & Dohme (MSD); NN24 Nigeria; Research In Motion (RIM), the company behind the BlackBerry® solution and A24 Media. ARTS & CULTURE AWARD, presented by John-Allan Namu, CNN MultiChoice African Journalist 2009. Judge's Citation: The journalist successfully tells the story of the place and importance of soup in Ghanaian culture. Soup, according to the writer, is not just a gastronomic element, but also plays a key role in literature, tradition, art, geography -- in short -- in the whole culture of Ghana. The story is also told through a delightful, well crafted and engaging writing which compels the reader to taste the soup. DIGITAL JOURNALISM AWARD, presented by presented by Christa Botha, Research In Motion (RIM), the company behind the BlackBerry® solution. Judge's citation: The Daily Dispatch reporter team did a thorough investigative report on slumlords and slum dwellings in King Williams Town. But it is the enriching of the story with creative tools from the internet that earns them this award. For example, the viewer can take a tour of the slum house, can look at their own neighbourhood to see there are slum houses on your street and can even report suspected slum lords. All of this enables the viewer to continue on a journey of discovery. Judge's Citation: The journalist took what appears to be a simple story and painted a beautiful picture. He told the story of women's friendship and also highlighted the business aspects, without labouring the point. This story shows business and finance. Judge's Citation: The environment category had some very strong entries. And although a lot of the time environmental stories are very technical, Hamila managed to blend the issue of conservation, culture, nationalism, and everyday life into a beautiful story that is also easy to read. Judge's Citation: This series of articles, in a direct and neutral manner, tackles two contemporary issues that are often at the roots of conflict in Africa: property and ethnicity. The story explores Cultural and Political Identity in a Continent moulded by its colonial past and constant migration. It shows an example of misuse of ethnicity by politicians, as is common in many other parts of the World. Ethnicity serves as a scapegoat for political division and exclusion, sometimes exploited by extremists with dramatic human consequences. It also explores the vital problem of land, traditionally seen as owned by those who are working on it. Judge's Citation: This is a great TV piece, extremely well crafted. Investigative journalism with a very human outlook. Najlae Bembarek takes us in a slum occupied by Moroccan migrants in the south of Italy. Misery, precariousness, desillusion: Najlae and her crew make us share the everyday life and the moods of these men(people) who had dreamed about an European Eldorado. FREE PRESS AFRICA AWARD, presented by Joel Kibazo, Chair of the judging panel. Abdulkhafar Abdulkadir Hasan, freelance; Mohamed Amin Adan Abdulle, Radio Shabelle; Hassan Zubeyr Haji Hassan, Al-Arabiya; Mohamud Mohamed Yusuf, Radio IQK; Mukhtar Mohamed Hirabe, Radio Shabelle; Nur Muse Hussein, Radio IQK; Abdirisak Mohamed Warsame, Radio Shabelle; Said Tahlil Ahmed, HornAfrik; Hassan Mayow Hassan, Radio Shabelle. Judge's Citation: It's journalism at its best. The stories won because they are comprehensive, objective and balanced. Judge's Citation A brilliant radio piece that highlights the plight of HIV positive patients in Africa. It is well-researched. The reporter talked to different people and managed to tell a complicated story through people. Judge's Citation: The set of pictures bring us directly to the life of the African child. It is a piece of Artwork achieved by the quality of the photos, the angles of contrasts between colourful light and shadows, which suddenly capture a particular moment of Africa's future. To get this result, the photographer has undertaken a patient search of such magic moments in life, where he could find some light next to the face of a particular child with a particular secret in his life revealed by the camera. These particular pictures tell us what cannot be said by any written article: despite the uncertainty towards the future, African children are forging their self-protection and safety, so they are clever in search of a light in the social darkness. - Histórias do Zango: E o Tempo Passou, Mas Nada Mudou! Judge's Citation: Resettlement of people is always a relevant topic which only becomes an interesting story when told in a comprehensive, compelling and professional way. That's what Sebastião does in this account about people who are moved from Ilha de Luanda to Zango in the outskirts of Luanda. Judge's Citation: With a group of forty migrants, Emmanuel takes the dangerous road that starts in Lagos. From Nigeria to Libya, across seven countries; the tale of an amazing trip and is an exceptional piece of investigative journalism. Judge's Citation: Piracy in the Indian Ocean is a global story often told from the vantage point of security and naval experts. While not being sympathetic to the pirates, Kassim Mohamed escorts us into their world by escorting the listener into Puntland, Somalia, and the homes of two pirates. They're not home, so he interviews their wives. The first wife shows listeners her and her husband's twin Prado's -- a fancy sports utility vehicle -- he sits on their luxurious couches and is shown the family AK-47 which is used to protect the ill-gotten gains. It's a fascinating insider account. Judge's Citation: This report is a winner because it is a lovely tale of how one man, despite being poor and blind, has kept his spirit alive and continues to conquer. It is one of those lovely stories that leave the viewer with a smile on their face and with hope for the future. By doing so, it reminds us that we all have the amazing ability to turn what some might see as negatives into positives. Judge's Citation: The journalist told the story with care and sensitivity. She did deep research covering all the angles including the victims, traditional doctors and even the police and the local media. The victims were given a voice and also overcame risks in telling the story. It is a complete piece of work. Judge's Citation: The story is balanced and comprehensive. It is a compelling piece of journalism, a simple story told in such a gripping manner. Judge's Citation: Pelu Awofeso is a lyrical and beautiful writer who takes you along on a journey instead of telling you about it. You feel as if you have been with him into the Biafra Bunkers at the National War Museum and that you have visited Calabar in Cross River State. He satisfies that first rule of travel journalism: you must want to go there. I certainly did after reading his work.